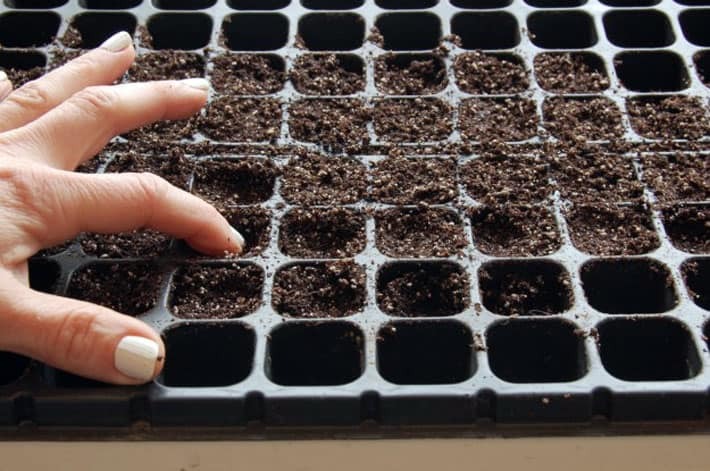 How to Start Seeds Indoors. Growing Your Own Vegetables. 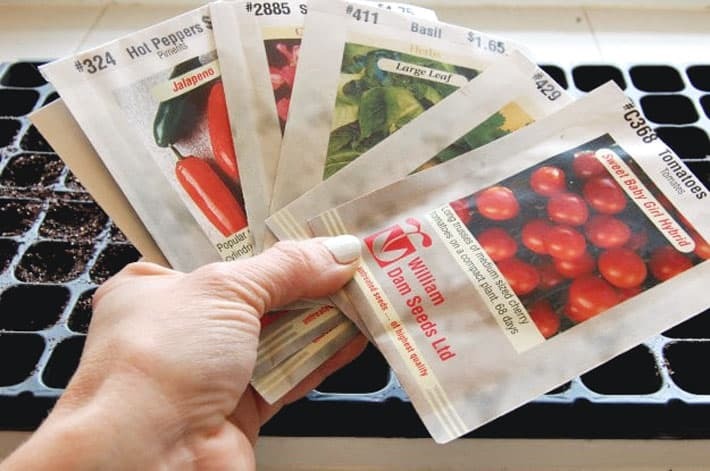 Want to know how to grow vegetables from seed? Well. It’s very complicated. You stick them in dirt and wait. 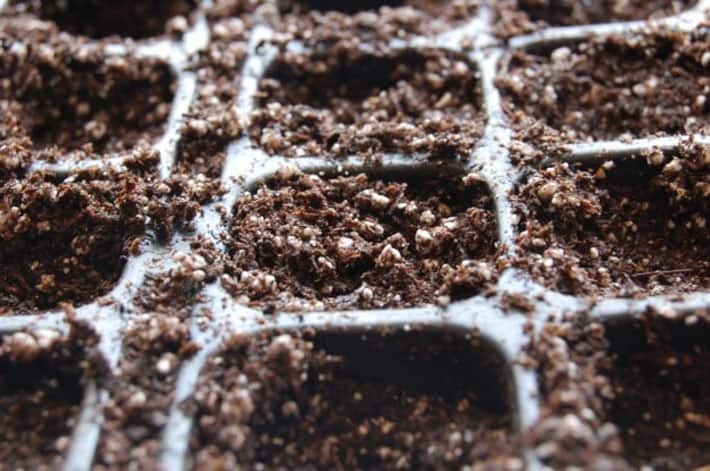 Add in these few more tips and you’re sure to have success starting seeds indoors. If you have kids that don’t like vegetables I’ll tell you right now, the easiest way to get them to eat veggies, is to have them grow them themselves. I say this with all the confidence of someone who doesn’t have kids. I was, however, a child myself at one point. That’s how I know this little method works. My dad always had a vegetable garden. The goal of course was to grow the biggest vegetables possible. Like most men, he thought bigger was better. If a carrot wasn’t the size of a table leg it was a failure. As is the case with a lot of kids who grow up around vegetable gardens, I wanted my own vegetables to plant. So my dad gave me some seeds for the fasting growing vegetable around. The radish. Not exactly the jelly beans I had imagined growing, but I gave it a shot. I grew those radishes and I ate them too. I can guarantee that if I hadn’t grown them myself I never would have sat down to eat a plate of radishes. 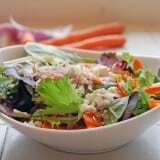 If you live in a colder climate like I do in Southern Ontario (Zone 6), where the growing season is a bit shorter than elsewhere, you have to get a head start on your plants. This can either mean, buying pregrown plants at a nursery or … starting your own from seed at home. 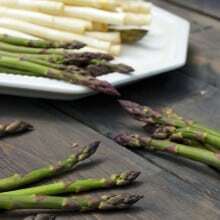 The advantage to starting them at home is you can grow varieties of vegetables you just can’t get in a nursery. 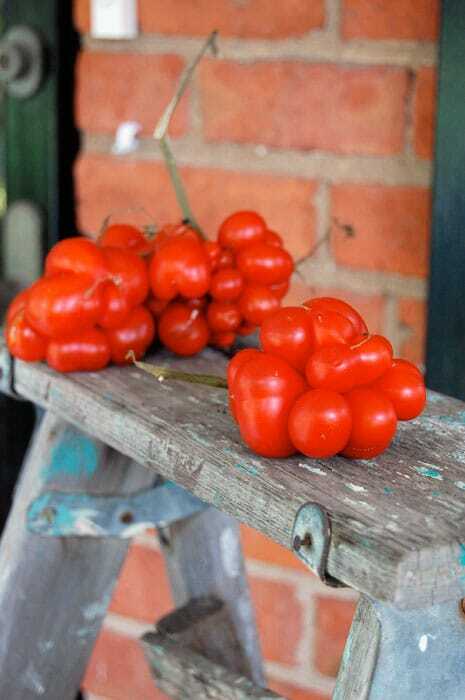 Things like these warty Reisetomate tomatoes. 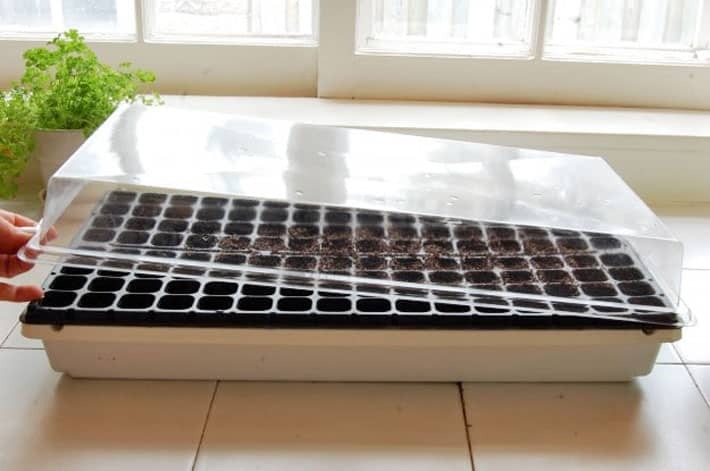 If you’re going BIG and growing a lot of plants, the best thing for you to invest in is a drip tray, seedling tray and lid. 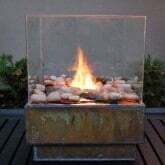 You can get these at seed stores and usually hardware stores like Lowes or Home Depot. 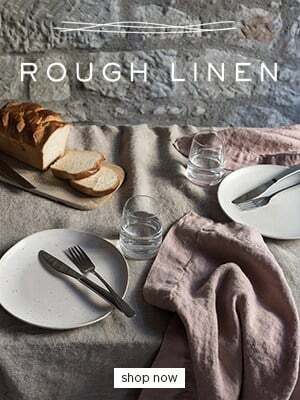 I wouldn’t buy them from a dollar store. You’ll want to reuse them year after year and the dollar store ones tend to disintegrate and fall apart when you look at them. 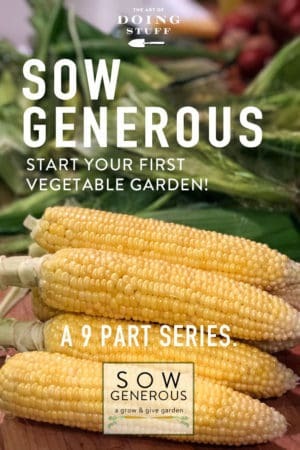 If you’re interested in starting seeds you might like to, join my “Sow Generous” program this summer. Starting a “Grow & Give Garden”. A group of people that commit to growing a vegetable garden this year and then giving some of the produce away. 🙂 You can learn more about it here. 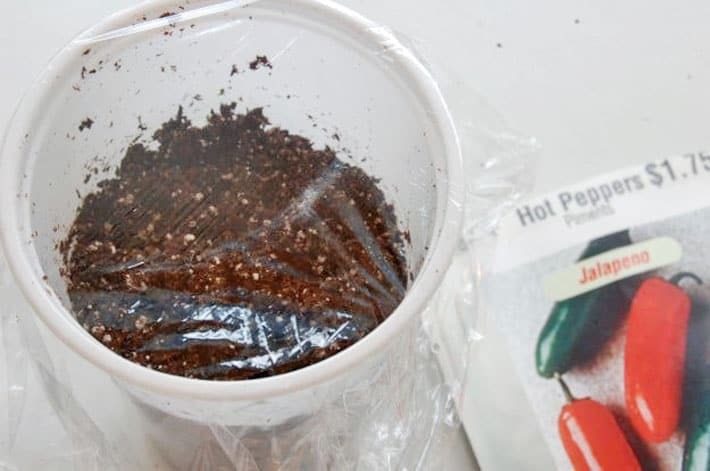 If you don’t want to spend the money on or can’t find the seed tray and drip tray, all you need are a few plastic pots or even plastic cups with holes punched into the bottom and some plastic wrap. If you want to get everything in one shot, I’ve compiled a list of everything you need on Amazon complete with 13 various seeds, a seed starting tray, heat mat, soil and plant markers, all for a total of just $77 which is a great deal! Just click here to see my Amazon Seed Starting Shop. You can also add in a full spectrum grow light for another $29. When you’re ready, this post has all the information you need about the next step, replanting your seedlings. 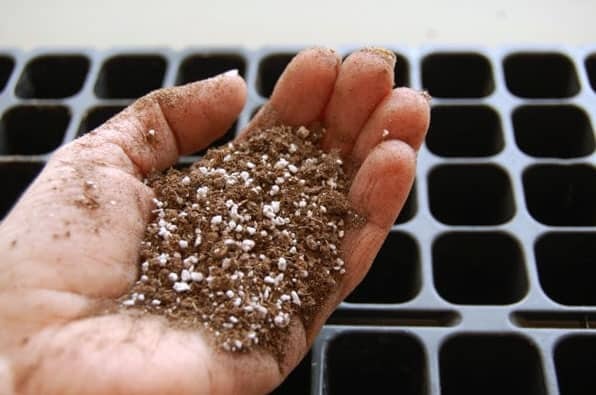 Soilless mix has no nutrients and is only used for starting seedlings, not growing them. 1. Soak the soilless mix with water. Before you fill your containers with the soiless mix, add enough water to moisten it and mix it with your hands. Squeeze out the water. The perfect ratio of water to soil is when you squeeze your soil very hard and a few drips of water come out of it. If it streams out, your soil is too wet. If nothing comes out your soil is too dry. 2. Fill your tray with the seed starter mix. Plant roots like a compact soil. It helps to give the plant stability. So, push the dirt into each divot with your finger so it isn’t quite so “airy”. You may need to refill the tray with more soil after you compress it. 3. Now it’s time to plant your seeds! Put two or three seeds in each cell. This way you’re guaranteed at least one plant will germinate. If they all grow, just weed out the runts by cutting the stem off at soil level. Don’t pull it out, because this will disturb the soil of the other seedlings. 4. Cover the seeds up with soil. A good rule of thumb is to cover the seed with the same depth of soil as the seed. 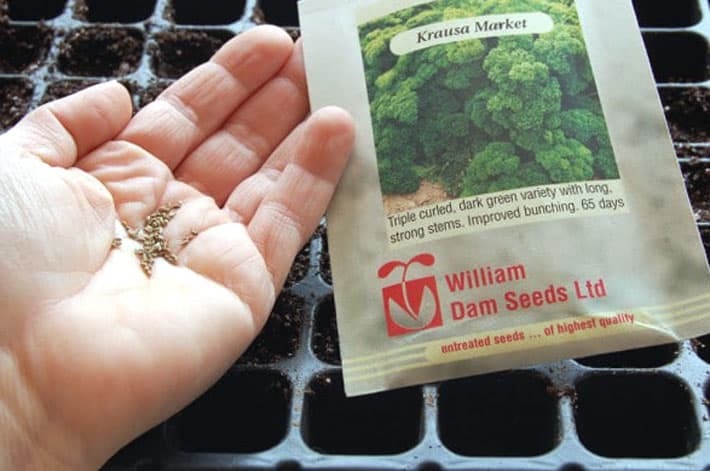 (A 1 mm seed will be covered with 1mm of dirt) Also, once you’ve covered them, press down on the soil with your finger to make sure the top soil is touching the seed. 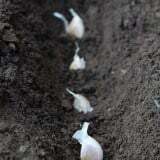 Seeds need to be in contact with all the soil around them to germinate well. For especially tiny seeds like poppies or snapdragons use sand to cover the seeds. It’s finer than soil and will help keep moisture in. 5. Cover your seed tray with a plastic dome. 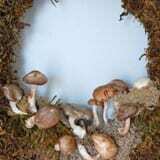 The dome helps create heat and the necessary humidity for the seeds to germinate. As soon as your seeds sprout, you can remove the lid. If you don’t have a dome or are planting into plastic cups or pots just cover the pot with plastic wrap and secure it with a rubber band. 6. Once your seeds have sprouted put them under fluorescent lights. I use T5 LED lights right now. They offer better light and last longer than traditional fluorescent lights. I personally have a 3 tiered seed starting stand. If I were starting from scratch I’d probably get these flat panel LED lights and build wood shelves, but the tiered grow light stands I use now are great too. To grow most things 32 watts per square ft. of plants is MORE than enough. For instance, if you have a 2′ x 2′ of plants, that equals 4 square feet which means you would need 120 watts of LED lights for growing. And like I said that’s MORE than enough. That would allow you to grow actual vegetables and flowers as opposed to just seedlings. 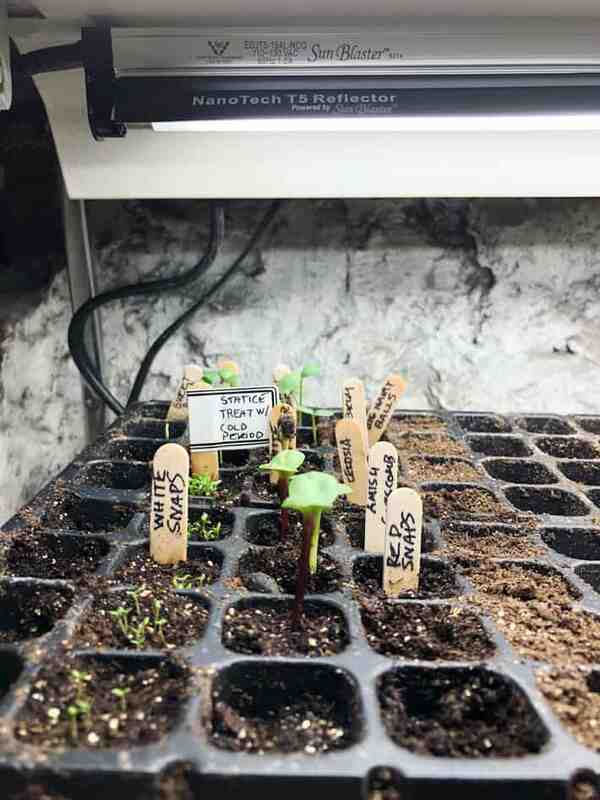 Once the seeds have sprouted, keep the tray under the lights. TIP – LED lights should be 8-12 inches from the top of your plants. T5 bulbs should be 5-6 inches from the tops of your plants. If you don’t have grow lights, just put your tray in a sunny window but make sure to rotate the plant so it isn’t always reaching the same way for the light.. Finally, you have to water these things. I’m fairly certain if you can recognize most of the words in this post, you’re smart enough to realize you have to water plants. 7. Water your plants by putting water into the drip tray and allow the plants to soak up the water for 10 minutes. 8. As your plants grow adjust the height of your lights. The height will depend on the type of light. Check your light instructions. And that’s really all there is to starting your own plants from seed. 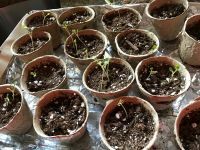 This is a very rudimentary introduction to growing plants from seed, but there should be enough information to get you started and stop you from being scared of it. Easiest Vegetables to Grow from Seed. Beets – these seeds are actually a cluster of seeds so for every seed you plant you could get 2-3 plants. 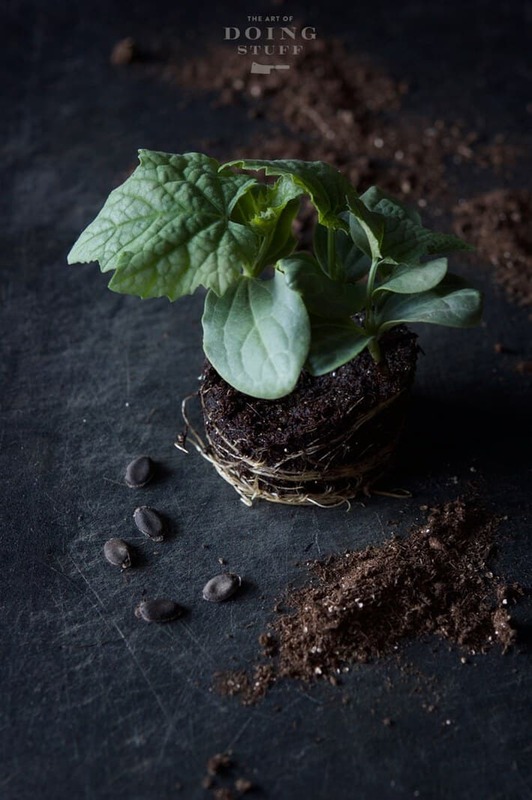 Peas – they can be planted directly outside in April because they like the cold but starting them inside helps improve germination and stops squirrels and mice from eating the seeds before they get a chance to start. 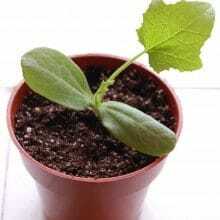 Squash – both winter and summer squash grow well from seed. Tomatoes – the star of every garden, tomatoes are one of the easiest plants to start from seed. Herbs – basil, parsley, dill, oregano, … all are great seeds to start. Kale – I actually only like one variety of kale, Black Kale, and I grow it successfully from seed every year. $5 to the first person who can grow a carrot big enough to support a harvest table. 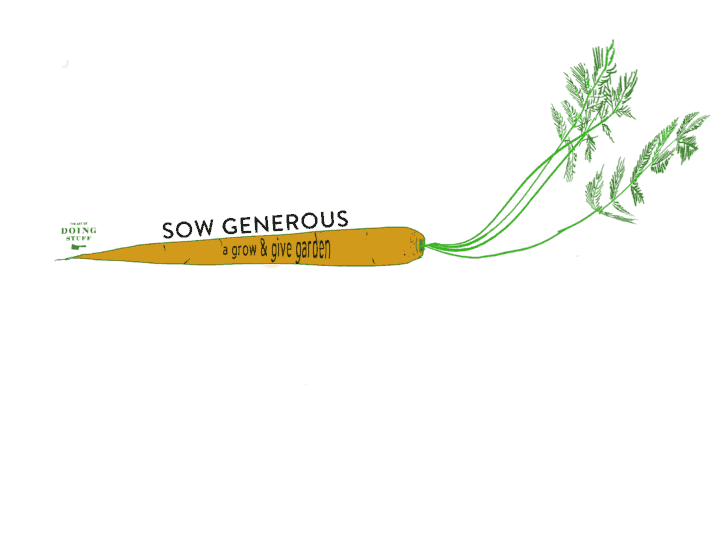 Click below to take the Sow Generous pledge. This post comes at a good time. I have started the “cup” method with my herbs except I planted like 20 seeds in each 4 inch container and they all sprouted so now I have to majorly thin them out. Agree with Adrienne — perfect timing on this post. Just about to plant my square-foot garden and not a clue as to which tomato seeds to buy. ‘Sweet Baby Girl’ FTW! Ugg I too don’t ever grow Broccoli cause of the nasty caterpillars! Nothing worse then cleaning it all and cooking it, only to just about eat one hiding in the stalk…eeww. I don’t grow carrots either as I get maggots in mine.. Thanks for the post Karen! Wasn’t it nice playing in the dirt after a long winter! Yaaa spring! Old joke: What’s worse than biting into an apple and finding a worm? Finding half a worm. Soak your broccoli in very salted water before cooking. Any critters will float to the top. I would like to add another easy vegetable– So easy that you ought to just wait and plant it outside: LETTUCE! You don’t have to wait very long, because lettuce loves cool weather. Check with your local nursery to find out when it’s safe. Then, laugh at those expensive bags of lettuce for months to come! 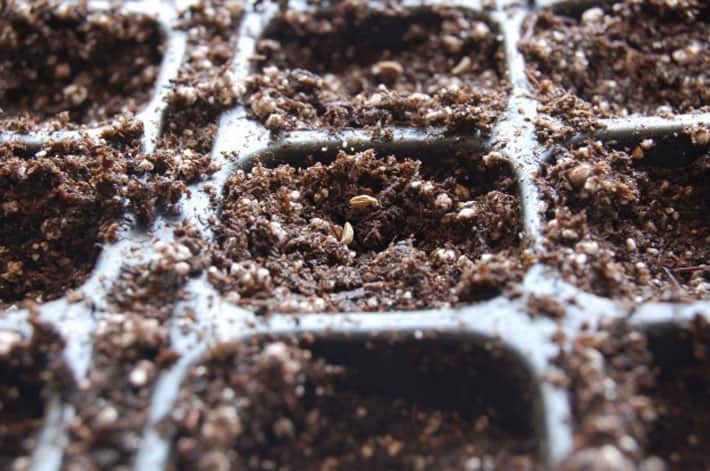 As for inside seeds, you can also use egg cartons if you don’t want to spring for seed trays. AND, your seedlings will be happiest if they sit someplace warmish. Yay spring!!! I also vote for mesclun mix lettuce- direct sown, cool crop makes for great mixed green salads. Can’t wait! A little tip for thinning our seedling runts- just snip off the smallest with scissors to avoid accidentally uprooting the seedling you want to save. Thanks Karen, I have been planning my first in upteen years garden. I was thinking about putting broccoli in the garden but now…..yuck!!! If I served slugs to my daughter she would never eat veggies again!! Any thoughts on damping off? It usually kills most of my beautiful seedlings, just as the true leaves start to unfurl. Hmmm…do I have to use this method if I live in Florida? Please so no, because I just planted some seeds in pots and stuck ’em outside. It’s really warm and sunny, think they’ll be ok? Karen I noticed your seeds are from William Dam, my favorite seed shop. Do you live close to there? I have a jalapeno plant growing right now in an Aerogarden (this ugly machine with a light where the plants grow in water. My boyfriend got it for christmas from his brother.) My mother in law in convinced no jalapenos peppers will ever grow. Tell me she is wrong. Your jalapeno plant made peppers right? Okay, okay. You’re missing a pretty important vegetable here – beans! They’re super, super, SUPER easy to grow, and they’re soooooo delicious and delightful! I was told to plant them in 2 week periods, so I did – I did a row, and then two weeks later another row, and so on and so on. It meant I had great fresh beans forEVER instead of a huge batch all at once. Oregano and thyme are easy to grow but they take over an entire garden, so keep those suckers potted. Kale is also a super hearty green that stays alive forever and just keeps going and going and going. Garlic! 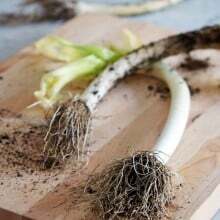 Although I think you have to plant it in the fall or something… you just pop the cloves directly into the ground – pretty deep, and you get awesome garlic! It’s pretty cool. You can’t use dried garlic, though, it needs to be fresh. Then, the last head we ‘harvested’ we just broke into individual cloves and planted each of them. The garlic was already coming up yesterday – pooh pooh to this snow! Speaking of herbs that take over, beware of mint! I planted chocolate mint one year, and swore at it for the next five as it spread everywhere. What the heck do you do with chocolate mint anyway, besides pinching off the odd leaf and making your friends smell it?? That thrill dies fast. Fun factoid: You can tell a plant is from the mint family if has square stems. I have a 4 foot wide rosemary plant that I cut down to almost nothing twice a year and it just grows so rapidly I don’t know what to do with it all! I’ve given bags of it away on Craigslist! It blooms 10 or 11 months out of the year on Vancouver Island. Silly plant. I find all my veggies get fungus 🙁 I was stoked to grow zucchini from seed last year and they were just getting big enough to pick and they turned all black. I was so sad!! Chocolate mint makes the BEST tea! Just hang some stems of it in ‘August’ or so until dry and crispy…store in a container to make fabulous tea (cold or hot) and impress your guests! I just went out and planted more seeds. With this on my face: http://www.mariobadescu.com/Drying-Lotion and in a low-cut shirt with no bra. Basically looks like pink chalk dots on my face. Ran into the landlord who works next door. 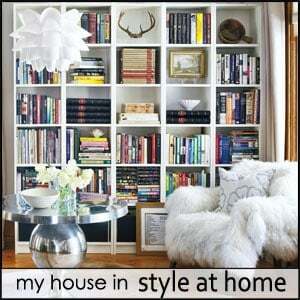 Sometimes working at home makes me forget about the boundaries between public and private attire. But it does let me plant a garden over lunch. Thanks for the inspiration Karen! I can’t wait to get my luffah seeds now. Perfect timing after that post. Maybe I’ll grow one pollvault size for the five bucks. I consider myself to have a green thumb, but have the worst time with tomatos and just gave up on them.. 🙁 However, I would try again if I can find seeds for the “ugly tomato”. I have looked everywhere! Wow I thought I would never get to the end of the comments. Another Florida girl here. Broccoli will survive in Feb March without slugs here. But once the heat and the daily rain comes… up comes the whole plant b.c I hate those slimy worms. UGH. But my kids love the broccoli, so gotta grow it. Beans are awesome. they work really well in pots too. Karen, wanted to give you a heads up on a box called the Earth Box. They cost about 30 dollars. (if you buy them) but if you make them yourself you can get em about 5 dollars. The area underneathe the wire become the water reservoir. A layer of newspaper covers the hardware cloth and then fill the container with soil. A small PVC pipe runs along the side of the container to funnel water to the reservoir. In Really hot hot areas where your soil is not good, or you want veggies on your patio, or condo this is a good idea. I haven’t tried it yet, as our weather is perfect right now, but later in June and July, I am going to try it out. Ok, that is my tip for the gardeners. good luck. Here’s my tip: soil block makers! I used to save yogurt cups all year long for seed starting, but then I found this block maker thing. Just smoosh the damp soil in there, and eject the blocks. 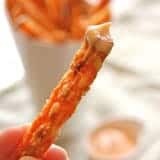 I put them directly in the drip tray. They don’t fall apart either if you pack the soil tight enough. And to plant them, obviously you just plunk the whole thing in the ground. I really wish I had seen this sooner! I had no idea that seeding soil existed and just got regular soil. Also, when do you start using plant food on them? I bought some and have used a little, but after reading that the seeding soil has no nutrients, I’m confused about it. You don’t need to use any plant food or fertilizer on the starters: a seed already contains all the food it needs to sprout and form it’s first baby leaves (I’m reaching realllly far back to 9th grade biology here: I think they’re called cotyledons). Basically, seeds have two parts: a tiny germ — which is essentially the “embryo” that will sprout — surrounded by a big nutrient “nut”, that gives it energy to sprout, form roots and the first leaves. After they’re sprouted, you plant the small starter block into a slighly larger pot/block that has nutrient-rich soil and let both the roots and leaves develop some more, then you harden them off (take them outside for progressively longer periods to let them get used to harsher conditions), then finally plant them in your garden. It’s not nearly as hard as it sounds! Thanks so much for this Karen- love the easy list…this is on my TO DO list for this year- I have to get better at growing veggies. Question- I know you said for the idiots- you realize you have to water..I think I OVER water?? ?..do you really need to water every day? sorry probably a stupid question but I really want to know! I would really love to plant my own veggies, but I live in a condo and don’t have any outdoor soil to call my own. 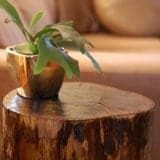 Are there any yummy plants that can be grown entirely in a pot? Oo yay! I have a little deck so I could use that. 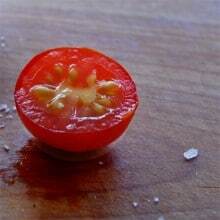 I want to try tomatoes. I loooooove tomatoes. 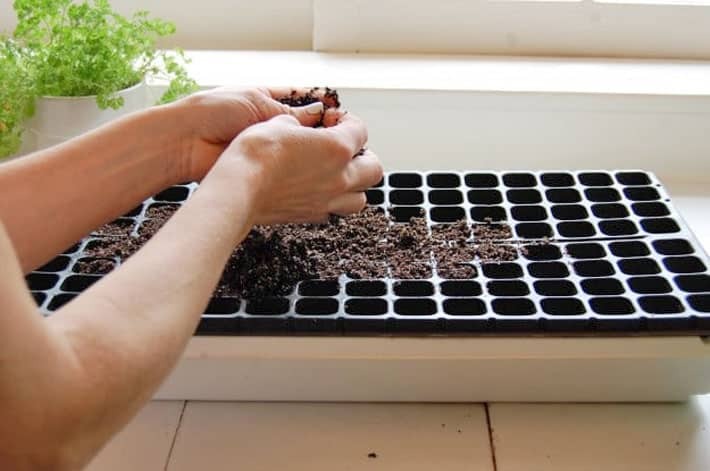 Seedling trays: I would buy six pack sized instead of those huge ones. Different seeds germinate at different rates so if you start brocolli and sunflowers in that big tray, the sunflowers will be a foot tall by the time the brocolli germinates. You need to be able to take the first sprouters out of the drip tray and leave the later ones in. It’s also easier to keep track of varieties (like three kinds of tomato plants) if you can sprout them in seperate seedling trays. I am so getting that block maker. Goodbye to my shed full of assorted plastic pots. Aaaand I suddenly want to throttle my husband. 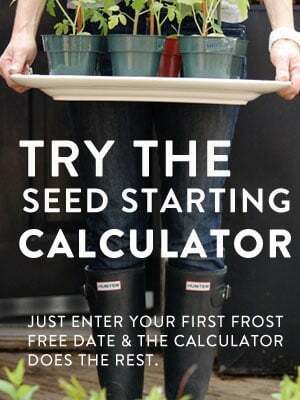 We tried starting seeds last year – we live in Cleveland so share your long winter and short growing season. Our seedlings grew, though not all of the seeds produced, but when I tried to transplant them it was a big effing fail. Most of them died. The plants didn’t survive the transplant because the soil completely fell away from them and their tiny little stems broke in my hands. And I am realizing, after reading this post, that the problem with the MANY MANY MANY seedlings we grew was twofold. 1) My husband never put a plastic cover over the trays and 2) the lights are about 2 feet above the table. *facepalm* Maybe I’ll give it a go again on my own, it’s not too late after all. I just need to find some plastic covers for our trays…. and then I realized I have absolutely no place for these suckers to go once they get full blown. I have no garden space. Hopefully my boyfriend will let me plant them in his backyard. Do you think that is a good idea? So, I planted all my seeds a few weeks ago and they look ready to transplant to the beds. But then, I’m not sure what exactly they should look like… is there a size they should grow to before being transplanted – a certain number of inches? I’m planting cucumbers, tomatoes, watermelon, peas, etc. Thanks! Hi Eliesa – I’ll need to know where you live (what Zone) in order to determine if you can plant out yet. Transplants can be planted out at any size, but they need to be hardened off. 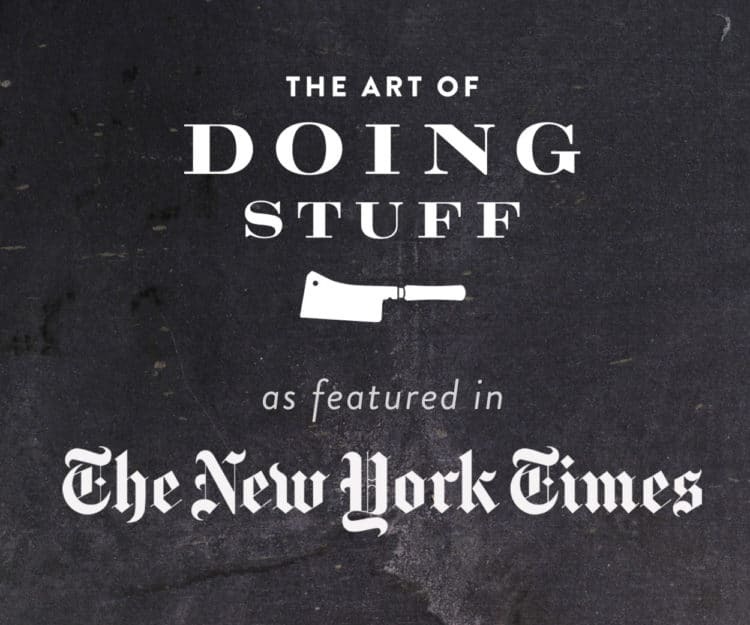 (become gradually accustomed to their new conditions) Email me at karen@theartofdoingstuff.com with your Zone and I’ll guide you from there. ~ karen! i would like to know how to fertilize young seedlings, just after they come up. and at what intervals. the plants i get from the nursery is so healthy looking…thanks..gb.. I start my seeds indoors. I used to buy those recycled paper cup thingies, but I now actually save the empty toilet paper rolls. I cut them in half, leaving me with two short tubes. Snip the edges of one end of your short paper roll, then tuck them under, creating a cup. My 3 year old had a blast with me planting all our seeds. When the weather is right, just plant them, toilet paper roll and all, in your garden. That way, there’s no disrupting the roots. 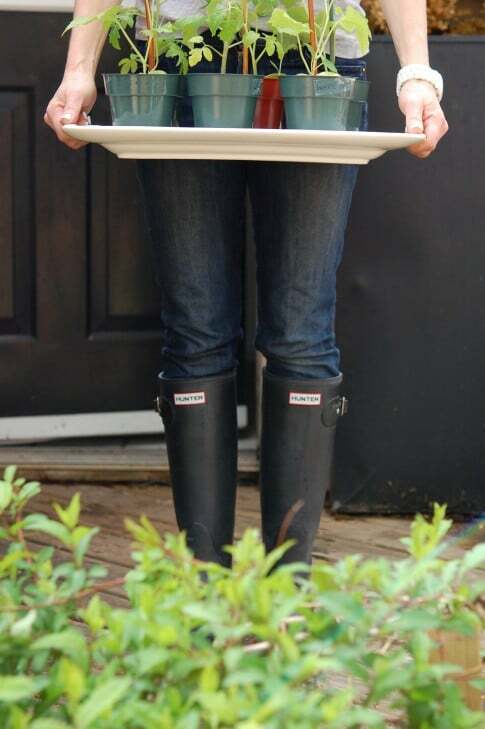 THANK YOU, I have that exact same tray filled with seeds, and my Moskvich tomatoes sprouted, but the rest of my veggies haven’t yet- and I couldn’t find ANYthing telling me if I needed to cover them before, or after they sprouted. Heaven forgive my black thumb, lol- you would never know my dad was a honcho for the USDA, rest his soul, lol. Bay Area, California – no problem with worms in the peppers here, but radishes get root maggots. So the only stuff my grandkids can grow when they visit in the summer is alfalfa sprouts and such. Love, Love, Love your website! Hubby and I are starting a patio garden. We have tomato plants and herbs so far. He mentioned that he wanted us to try starting plantings from seeds. Your website gave me so much information, now I have to admit I am excited to give it a try. Thanking you from beautiful Naples, Florida. Have a bountiful day! Thanks Karen. Starting seeds is a LOT of fun! Addictive even because you can try so many varieties of plants that just aren’t available at nurseries or the garden centres where you normally buy seedlings. I don’t think my day will be all that bountiful. There’s still a foot of snow on the ground here, lol. (NOT normal for this time of year). ~ karen! Just to clarify, cover the tray with the lid and place the tray in a window. And you take the lid off to spritz with water every so often? Then when they sprout, the lid is always off. I’m a newbie here! Also, can I use miracle grow garden soil to start the seedlings (that’s what I have at home right now)?? Yes, that’s right Ashley. As soon as they sprout the lid comes off. You probably won’t need to spritz if the soil you planted it was wet enough. Condensation builds up in the tray, then drips down. You can use the miracle grow soil if you like. I always recommend soilless mix because it’s guaranteed not to have any contaminants, and it’s nice and loose for new little roots to start in. But use what you have. If you live in WA state, this really will be just an experiment because none of your little plants will make it til spring. 🙁 What zone are you? This calendar/calculator of mine might be helpful to you … ~ karen! Here’s a tip for planting seeds…….every time you crack an egg over the winter, crack the top off, wash and keep the rest of the shell (1/2 to 2/3 of the egg shell) In Spring, fill with planting soil and sow the seeds. You can keep them in a flat egg crate too….and just keep damp. 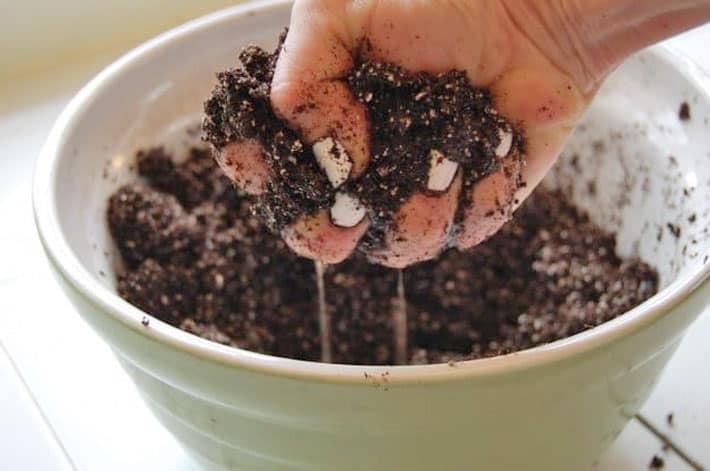 After they have sprouted and are hardened off, just plant the whole thing….the egg shell will break down and provide much needed nutrients to the plant too. Also..for those of you with small spaces….Google “companion planting” for veggies. ie: grow tomatos in a big pot & plant carrots with them – they do well together. Same with radishes and lettuce – one grows ‘down’ while the other grows ‘up’. We live in the Okanagan area of B.C., Canada – and we have a long HOT, DRY summer. Planting in pots allows me to move things into the shade when it gets too hot and dry. wear their footwear, and the players happily sign-up. Okay my first attempt at starting seeds was kind of a sh*t show. So I am going out and getting the trays because trying to mcguyver the stuff together, while more cost effective is just not working due to the fact that everything is in different containers and different sizes and they all just can’t be together somewhere they’re kind of all over the place. But I am wondering how do you label what you’ve planted when u use the tray and can I just keep the trays once filled on my porch or do they need to be indoors. Thanks! Hi Sabrina. The trays and clear covers (to keep the humdity in while sprouting) really do help. Whether you can start them outside or leave them outside once started really depends on where you live and what it is you’re starting. Some seedlings do fine with (and even prefer) cold weather, others will die immediately with it. Example of cool weather crops are broccoli, kale, beets, lettuce, peas. Examples of warm weather crops that don’t like cool temps are tomatoes, squash, zucchini, peppers. ~ karen! Might I add that if your house is below 50% humidity, then the plastic cover should be propped open to prevent fungal diseases but still retain some humidity. Up here in the great, white north (which is still white in some places), the heating is still on in the house and it is extremely dry. Karen has, of course, everything covered on growing from seeds, and also having children grow some things themselves. But some kids are just stubborn. I have a tip for anybody with kids who just can’t seem to interest them in helping to grow things. My daughter wanted nothing to do with gardening. She didn’t like dirt, or sweating, or having to actually take care of something to keep it from dying — none of it. She also had no interest in ever eating a vegetable. But two things got her interest and cooperation and made her actually want to eat things. I would send her out to the garden while I was making dinner and ask her to find the reddest, roundest, most perfect tomato for me. It sometimes kept her busy for up to half an hour, searching every single plant to find the coveted PERFECT thing. Same for bell peppers and a few other things. And if she picked it, she’d eat it. The other way to get her to try things she ordinarily thought were yucky: let her thread kabob skewers. We actually spent many pleasant hours each summer sitting together on the patio threading meat and veggies on long kabob skewers for the BBQ. She loved it when the “swords” were cooked and everyone got to slide the items off themselves. She’s in her late 40s now, and eats most veggies. My kids help me in the garden, but they still don’t want to eat anything. My favorite was my daughter who said something like, “Ew! I’m not going to eat those! They grew in dirt! !” I’m not sure where she thinks the veggies and fruits in the store grew… Hahaha. “She’s in her late 40s now, and eats most veggies.”, Hahahah! Well good job Grammy. ~ karen! I still have a seed pack from your post several years ago for ‘gem ‘corn. Found it last year when cleaning out a drawer and it’s been next to the toaster since waiting for me to plant them. IF I can get these to sprout, I could anything to sprout. My biggest problem is having a place to grow them that the deer won’t eat them. I will do it this week, I will do it this week, I will. I’ve always been told that you should have the lights as close to the plant as possible, especially in the beginning. I’m using fluorescent. Thoughts? That’s true. Especially with the case of fluorescent which don’t get hot enough to burn the plants and aren’t as strong as the newer ones. But you also have to remember that the lower the lights are the less width span you get out of them which reduced light available to the plants on the edge. As long as your plants don’t extend beyond the width of the fluorescent then you’re good. 🙂 ~ karen! I retired my seed-starting hobby a few years ago when I had to offer temporary shelter to a family member and his “stuff”. That meant my “stuff” had to find a new home which ended up being my seed-starting table in the basement…because the basement floor seeps water when it rains. Then I met the BF and gave him the shop light I was using for his shed. The family member has since moved out and my daughter took over that bedroom and turned it into a gym…so I still don’t have room for all that “stuff” on my table. 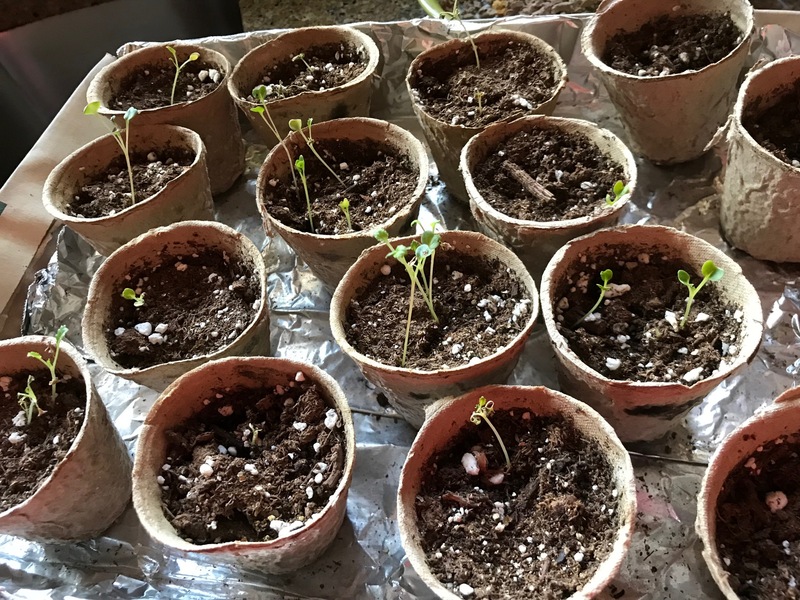 This post has me green with seed-starting envy and I’m dying to throw all that stuff in a dumpster since I haven’t looked at it in three years, reclaim my light, and start some seeds! Hi Karen- I need help and don’t know who else to ask! So, since you posted this, I felt I could ask you without coming at you from outta the blue. I planted lacinato kale seeds in small peat pots and they grew pretty well. They are so long and leggy, though. They still are only a couple of inches tall and they have no breadth to their stems, or whatever they’re called. I don’t have growing lights, but move them around all day to keep them getting some kind of light. Then, I think I made an almost deadly error by giving them water soluble fertilizer. They almost all died, but somehow made it through that. Is there anything I can do to help them grow better? Or should I give up and get plantings from the store. I live in the US in MD and it’s been one cold spring. These seedlings I have are about 3-4 weeks old. Am I just wasting my time? Thanks for any help you can offer!